On the way to work, on a very crowded train, I pondered. I drank in and thought about graffiti: it's makers, the ones who cover it over, why the ones who make it keep remaking it as the ones who cover it over keep covering. 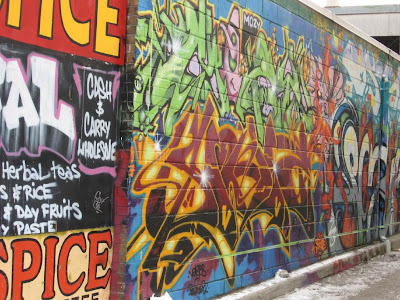 Toronto had the best graffiti I've seen. Toronto has more people espousing creation=life=revolution then Chicago does. I want revolutionary companions. I want ones not afraid to commit acts considered illegal by the establishment. Encouragement and support is needed. I want ones who have an imagination and a vision of better worlds to share. I want ones who know what I'm talking about when I talk about better worlds. I want ones unafraid to inhabit the cracks of the sidewalk where the living little plants grow up from. I want a friend who'll come out with me to go around the city posting signs, letters, and notices to the world from people they don't see and viewpoints they might not consider. I want to cover over the lavalife dating posters in the buses that make me cringe with posters containing images of Medusa and words reminding people to think about beauty for themselves. I want to be reminded, everywhere I go and everywhere I look, that the universe waits to delight in me. I'm going to have to keep creating. It's the only way. Thank god I write. If I didn't I don't know who I would be. because the creation and destruction are both the revolution and go hand in hand. Are you looking for a revolutionary, or the fawn from "Pan's Labyrinth?"